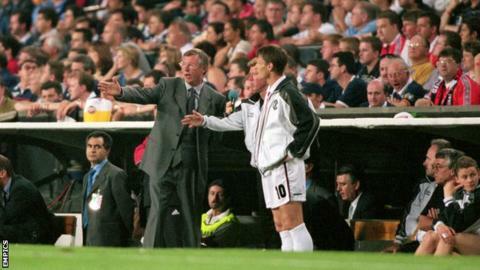 Teddy Sheringham says he cannot imitate his former boss Sir Alex Ferguson as he embarks on his first managerial job. The 49-year-old, who was part of Manchester United team to win the Treble under Ferguson in 1999, was appointed by Stevenage in May. "You only do what you've been taught. I've played for some fantastic managers, I'll take out the best bits of them and use them in my own manner. "I can't try to be Sir Alex Ferguson," he told BBC Three Counties Radio. Sheringham replaced Graham Westley at Broadhall Way after Boro lost to Southend in last season's League Two play-off semi-finals. The former Tottenham, Nottingham Forest and England striker says he has enjoyed the new challenges he has faced in his first few weeks of management. "I'm loving it, it's a lovely place to come and work. There's nothing that's surprised me yet, but whatever has been thrown my way, I say: 'OK, let's deal with it.' If I can't do anything about it, I don't worry about it. "Being the manager is very different but I'm growing into that as well; controlling the meetings and getting my point across, which I've never done before. "I'm enjoying trying to work out what's right and wrong for me while I'm approaching 20 or so players." His assistant Kevin Watson promised in June that Boro will "play a little bit of a different way" to the direct style of Westley. And Sheringham said pre-season will be a process of learning for him and the players. "I'm learning every day - that's what the training ground is for, so that they learn, we learn and we progress together," he added. "The games are what it's all about. You train all week to produce your best stuff, and ultimately it's learning about what we can and can't do on the football pitch."